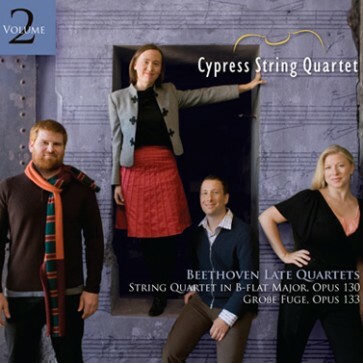 "In the forest of Beethoven recordings, the Cypress String Quartet's are some of the mightiest trees. Compounding the success of its first installment of late-Beethoven quartets, the San Francisco-based ensemble here considers the great B-Flat Major, Op. 130, offering special insight by including both the original "Grosse Fuge" and the later, alternate finale. The performances are masterly: technically assured and lucidly conversational. After this, one can hardly wait for the third and final release." "The Cypress' joie de vivre in this music shines through in this movement, courtesy of close miking by engineer Mark Willsher. The Cypress project a feverish but delightful intensity into the mix...A fine album of chamber music, certainly a must for collectors of modern Beethoven surveys." Copyright 2010 Cypress Performing Arts Association. Printed in U.S.A.